Photos and report for solar powered flashlights provided for the Living Compassion Organization’s project in Zambia, Africa where there is no electricity. 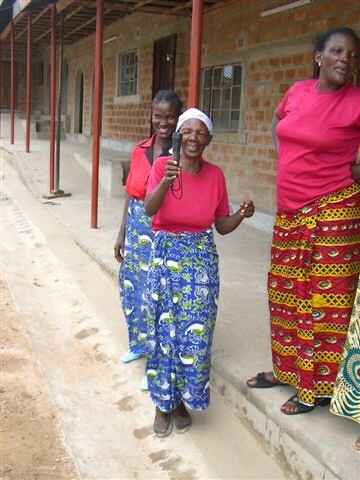 A few months ago you were kind enough to provide our organization with some solar flashlights for our project in Zambia. At that time I promised I would send you some photos of our distribution of the solar lights. I am in Zambia now at the end of a week-long trip to work on our project here. We have a number of people in our project who are using and appreciating your flashlights every day. There is no electricity in the slum area where we are working, so those flashlights are the only source of light for the people who have them. Yesterday I gathered some of them together to take their photo with the flashlights. Thank you again for your generous assistance. We also have been using the solar lights at the Monastery where I live and are enjoying them there also. Take care, and I will look forward to speaking with you again in the future. One of the reasons we were so determined to get out to Kantolomba today was to give the four boys in the scholarship program who passed their grade seven exams their solar lights. It is impossible for most of us in the West to imagine what it is like to have no source of light after the sun goes down. Consider trying to do your homework! We felt like a perfect way to honor the commitment and perseverance these scholars are showing would be to give them a source of nighttime light. They were thrilled. Jen explains how the solar flashlights work. 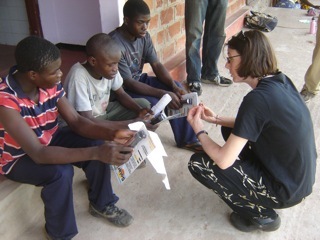 Congratulating the boys on their hard work, giving them solar flashlights.